Shapes Blow Out info about the game-Games2Rule. 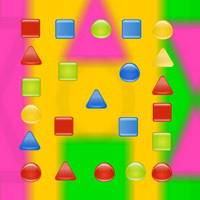 Shapes Blow Out is the 20 levels skill based game as you have to clear the required colored shapes as fast as possible to get more scores. Follow the directions carefully in every level because if you burst the wrong colors, you will loose a life. Be careful, some levels require a bit of planning and thought to complete more than others. Good Luck and Have Fun!